This array of IR LED/phototransistor pairs is great for precisely identifying changes in contrast/reflectance (like line-detection). 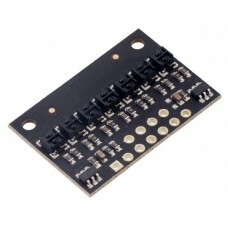 It operates from 2.9 V to 5.5 V and offers dimmable brightness control independent of the supply voltage. In general, the closer the object, the higher the contrast between light and dark, but high-reflectance objects are generally detectable out to around 50 mm. 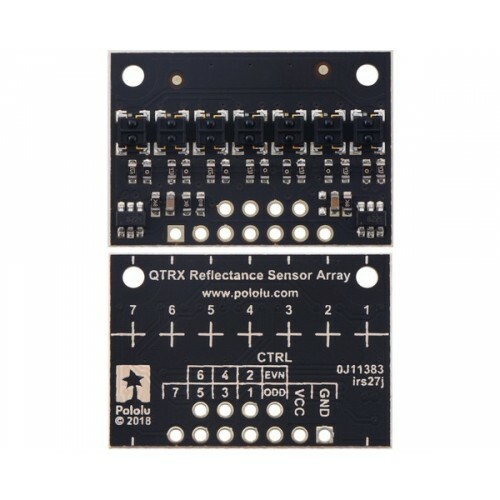 This version features high-performance, low-current QTRX sensors with lenses. 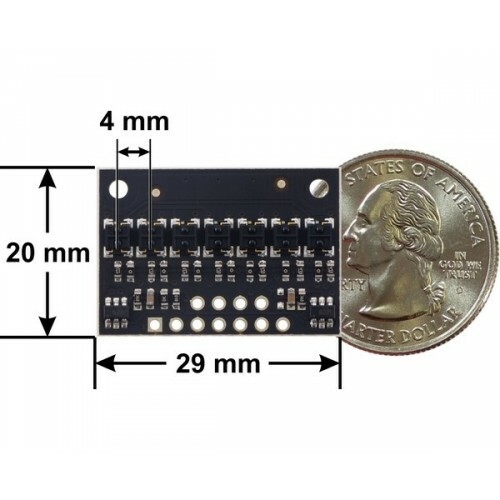 These reflectance sensors feature a linear array of IR emitter/phototransistor pair modules in a high-density (4 mm pitch) arrangement, which makes them well suited for applications that require precise detection of changes in contrast, such as line sensing. A variety of sensor counts are available so you can pick the ideal length for your application. Unlike our original QTR sensor modules, these units have integrated LED drivers that provide brightness control independent of the supply voltage, which can be anywhere from 2.9 V to 5.5 V, while enabling optional dimming to any of 32 possible brightness settings. 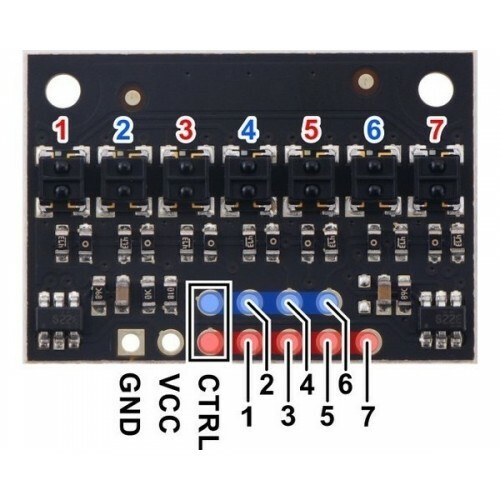 For modules with five or more sensors, there are separate controls for the odd-numbered and even-numbered LEDs, which gives you extra options for detecting light reflected at various angles. See the “Emitter control” section below for more information on using this feature. Schematic diagrams of individual QTR HD sensor channels for A version (left) and RC version (right). 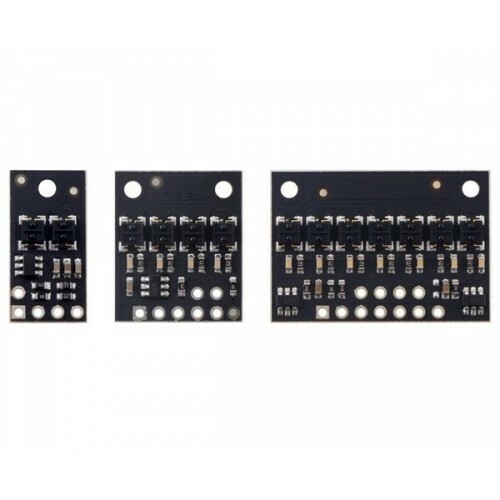 These reflectance sensor arrays maintain a constant current through their IR emitters, keeping the emitters’ brightness constant, independent of the supply voltage (2.9 V to 5.5 V). The emitters can be controlled with the board’s CTRL pins. Units with 5 or more sensors have two emitter control pins: CTRL ODD and CTRL EVEN. By default, these are connected together with a 1 kΩ resistor and pulled up, turning on all the emitters by default and allowing them to be controlled with a signal on either pin, but the CTRL ODD and CTRL EVEN pins can be driven separately for independent control of the odd-numbered and even-numbered emitters. Units with 4 or fewer sensors have a single CTRL pin that controls all of the emitters. QTRX-HD-07A Reflectance Sensor Array dimensions. 1 Independent of supply voltage; can be dynamically reduced to any of 32 available dimming levels. 2 With all LEDs on at their maximum brightness setting. 3 Available by special order only; contact us for availability.